A White-winged Dove, Zenaida asiatica, looms over a House Finch, Haemorhous mexicanus. . Considered a medium-sized dove, this member of the bird family Columbidae, looks huge when paired against the smaller finch. Both bird species are common here in Texas, especially as backyard birds regularly visiting feeders. The dove’s gender is unknown to me, though I’m sure other doves can tell whether its male or female. Proliferation of dove babies will be proof of the gender identification and the spring and summer socialization that will follow. The finch is male in winter breeding colors. There was no purposeful looming by the dove. It was just two birds hanging out in winter-barren tree, each awaiting its turn at the sunflower feeder or water feature. This entry was posted in Backyard Birding, House Finch, Uncategorized, White-winged Dove, Wildlife Gardening and tagged Austin Garden, Biodiversity by Tina. Bookmark the permalink. It’s a wonderful photo, Tina, and a beautiful reminder that it’s not all competition out there in the bird-world. I especially like the composition, and the way the finch’s color takes center stage. Thanks, Linda. I have a new camera and I was just trying for a distance shot of the House Finch. Once I downloaded, there was the dove, the deep red of the finch and the various limbs of the tree. I really like the photo. Great shot. I had some House Finches stop by, but they didn’t stay for long. They were scarce here until the past few weeks. They’re all-in now for the seeds–both those in the feeder and the ones on plants! Oh, this gave me a real chuckle. Great shot! Happy Friday–always good to start out with a laugh! Thanks–I was pleased with it too! Sometimes it helps not to think too much! 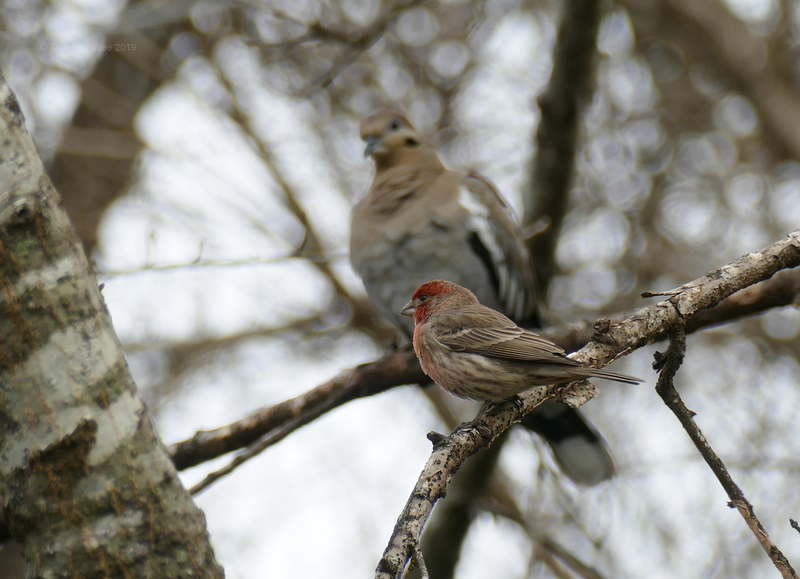 They are regulars here in S. Wisconsin, too–the house finches year-round, and the mourning doves during all but the coldest winter bits. Both are very hardy birds. 🙂 Lovely image. Thanks, Beth. They are both hardy, with the exception of the finch eye disease, which, thankfully, I haven’t observed any of this year. Hope you stay warm and safe in cold Wisconsin over the next few days.